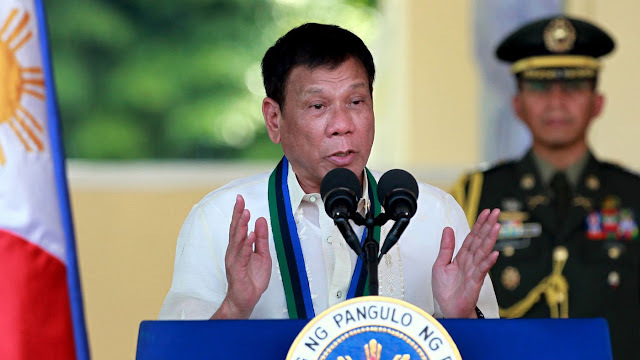 Home / Opinion / A Teacher bravely defended PRRD: "His god is righteous and wise unlike the god of those who falsely accuse"
A Teacher bravely defended PRRD: "His god is righteous and wise unlike the god of those who falsely accuse"
President Rodrigo Duterte have faced criticisms from several church groups who were offended after his controversial remark calling God "stup*d". Last week, the President questioned the Genesis creation story and why the God would tempt Adam and Eve, whom he created. 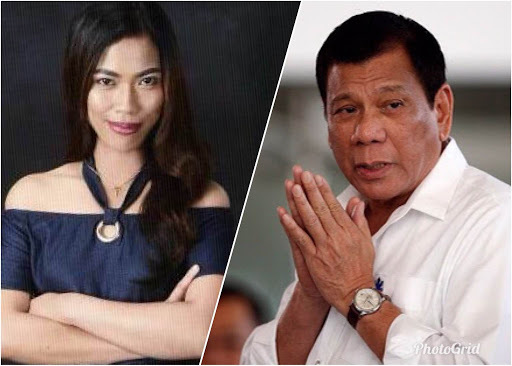 A Teacher from Mindanao Zenmar Luminarias Gendive shares her standpoint through her social media account concerning to the President's recent remarks. 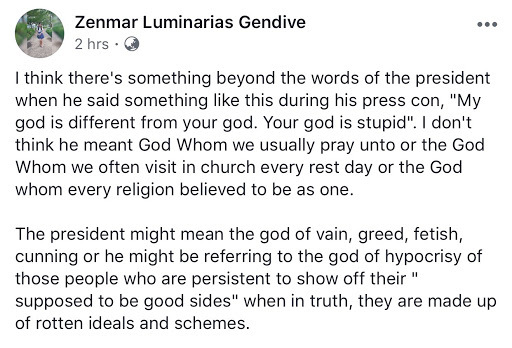 In her published Facebook post, Gendive defended President Duterte from all the criticisms as she believes the President's God's comment did not represent the "God Whom we usually pray unto or the God Whom we often visit in church every rest day or the God whom every religion believed to be as one." 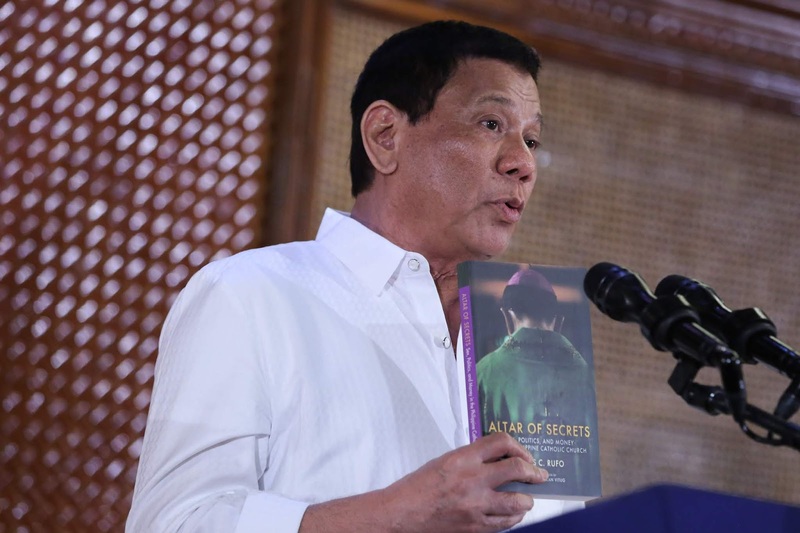 She added that Duterte God's rant refers to the "god of vain, greed, fetish, cunning or he might be referring to the god of hypocrisy of those people who are persistent to show off their " supposed to be good sides" when in truth, they are made up of rotten ideals and schemes." President Duterte have already clarified the issue that he was not talking about his God and was instead insulting the God of his critics and has formed a committee to dialogue with the Catholic Church to lessen the rift between the government and the Church. 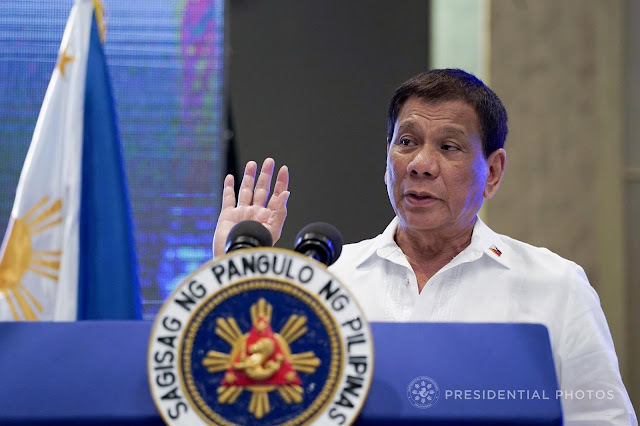 I think there's something beyond the words of the president when he said something like this during his press con, "My god is different from your god. Your god is stupid". I don't think he meant God Whom we usually pray unto or the God Whom we often visit in church every rest day or the God whom every religion believed to be as one. who are persistent to show off their " supposed to be good sides" when in truth, they are made up of rotten ideals and schemes. As I see it, the president only wants to emphasize that despite the criticisms and the skepticisms in relation to the killings of the church priests which were being blamed in his administration, he won't be swayed and that he will stand firm for what he and his God believe in; that he will never change the idea of his faith and cling to the false gods of those who wash their hands with Arab oil and those who blindly turn on the wrong faith. His god is righteous and wise unlike the god of those who falsely accuse and those who commit grave offenses then pinpoint others for committing that crime.